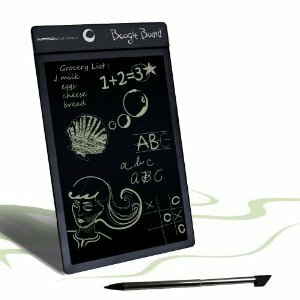 Today, I learned about the Boogie Board LCD Writing Tablet . It is a little pad that you can write on with a stylus, fingernail, or many other devices. It handles thin lines, thick lines, and lines of variate thicknesses based on the pressure to the pad. You can doodle on it, take notes, or write a to do list. And it doesn't need much electricity at all to keep your notes on it for the life of the product. Sounds like a wonderful $40 product to replace the pen and the papers. The only problem . . . there is no internal storage on the Boogie Board LCD Writing Tablet, so only the current page is saved. There is no memory card slot to save your notes onto. And there is no USB port to download your current note. There is basically no way to archive the data and save it to your computer. That means it will never replace the pen and the paper. Sitting here, looking at the cool device with one major fault, it occurred to me that there is one way you can save your notes. And that is to use your digital camera to take of picture of the note. Because the pad is dark, you'll probably have to use negative exposure compensation to preserve the brightness; I suspect -2 exposure compensation. Using the digital camera is a good way to memorize the notes in a home environment. But this method is quite cumbersome in an office environment. And it increases the $40 to the hundreds range that depreciates the usefulness of the Boogie Board LCD Writing Tablet. Alternatively you could just use a piece of paper and take a photo of that. Good point. And a piece of paper is easy to archive with a scanner.